Mega Sale! 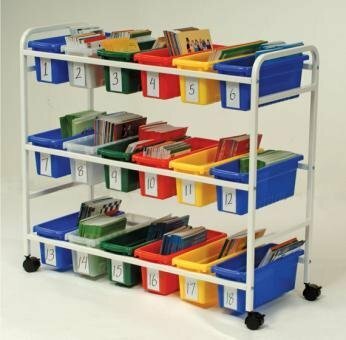 Save 26% on the Leveled Reading Book Browser Cart by Copernicus at Indsight. SKU: ZL1045. MPN: BB005-18. Hurry! Limited time offer. Offer valid only while supplies last. BB005-18 Features: -4 locking casters. -18 small book tubs. -Number of cubbies: 18. Product Type: -Cubby. Double Sided: -Yes. Casters Included: -Yes. BB005-18 Features: -4 locking casters. -18 small book tubs. -Number of cubbies: 18. Product Type: -Cubby. Double Sided: -Yes. Casters Included: -Yes. Primary Material: -Metal. Compartments Included: -Yes. Frame Color: -White. Number of Compartments: -18. Dimensions: Overall Height - Top to Bottom: -36". Overall Width - Side to Side: -41". Overall Depth - Front to Back: -17".